Your electronics can now see in dazzling color with this lovely color light sensor. 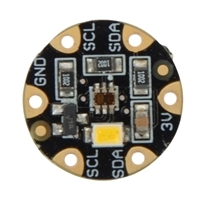 We found the best color sensor on the market, the TCS34725, which has RGB and Clear light sensing elements. An IR blocking filter, integrated on-chip and localized to the color sensing photodiodes, minimizes the IR spectral component of the incoming light and allows color measurements to be made accurately. The filter means you'll get much truer color than most sensors, since humans don't see IR. The sensor also has an incredible 3,800,000:1 dynamic range with adjustable integration time and gain so it is suited for use behind darkened glass or fabric.